If taking advantage of your outdoor living space all year long is something that interests you, it’s time to turn to Allmaster Home Services for the installation of a beautiful and long-lasting sunroom. Manufactured by the trusted brand BetterLiving Sunrooms, our incredibly sturdy sunrooms are ideal for homeowners in the Lutherville-Timonium, Maryland, area who are looking to enjoy the outdoors no matter what the weather is like. These fully insulated structures will add an entirely new dimension to your residence as well as a beautiful and lustrous aesthetic appeal. 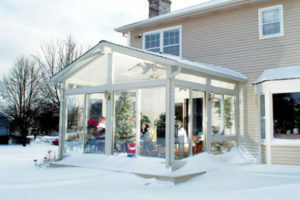 What’s more, our sunrooms are available in three beautiful styles – studio, gable, and enclosed porch – so you can select the look that best suits the appearance of your unique home. Our structures also come in beautiful color options, making it easy to choose the hue that will best blend with your residence. Additionally, every sunroom we offer is installed by our team of expert installers, so you can trust that your new structure will be put into place with the utmost precision and care. And, because we proudly stand behind every sunroom we install, we will back your new investment with a 50-year manufacturer’s warranty for added peace of mind. To learn more about the many advantages that will come with having a sunroom installed at your Lutherville-Timonium, MD, residence, contact Allmaster Home Services today.